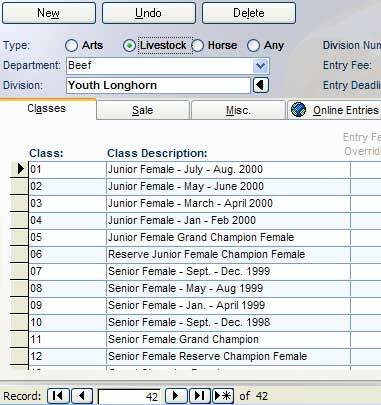 Note: A tool was added beginning with ShoWorks 2012 which allows one to easily copy classes in one Division to many others in a matter of a few clicks. See the tool "Division Update Wizard" under the Tools menu in ShoWorks. This article remains as an example to show methods of copying other types of records. 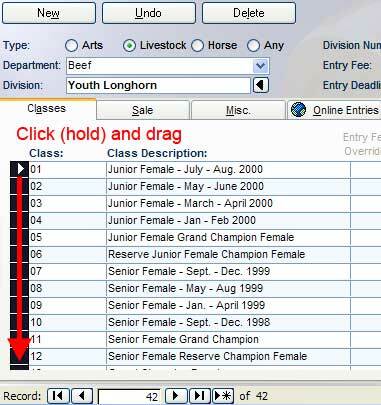 ShoWorks allows for copy/paste of one or more records from within a ShoWorks data file. Oftentimes a user may need to copy multiple records in order to speed up data entry. This is most common with Classes among different Divisions, or Points & Premiums. Locate the records that you want to copy. 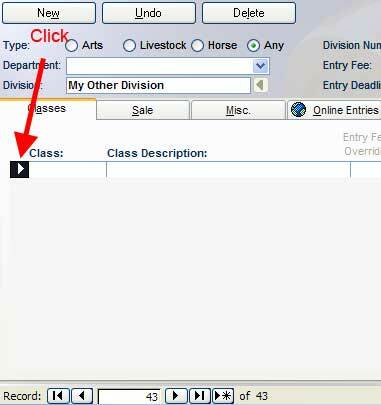 In this example, we will copy classes from one division to another. Highlight the records by clicking and dragging on the gray record selector buttons to the left of each record. Select Edit>>Copy from the menu bar at the top of the screen OR if the menu bar is not available, press the Ctrl-C keys (press the Ctrl key and hold while pressing the C key). Locate the place to paste the records. In this example, we will go to a new division. Highlight the new record selector by clicking on the gray record selector button to the left of the empty record. 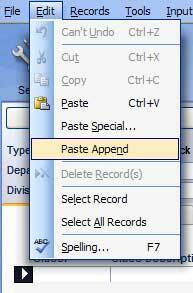 Select Edit>>Paste Append from the menu bar at the top of the screen OR if the menu bar is not available, press the Ctrl-V keys (press the Ctrl key and hold while pressing the V key). You should now see new records. You may need to refresh the menu to see all records by reloading the menu.